•	Open plan lounge with fireplace and access to the dining room. •	2 double bedrooms with en-suite bathrooms. An internal staircase leads up to the terrace which could be covered and transformed into an additional room. •	In the basement there is a large garage which can also be accessed from inside and providing ample space for a large cantina. 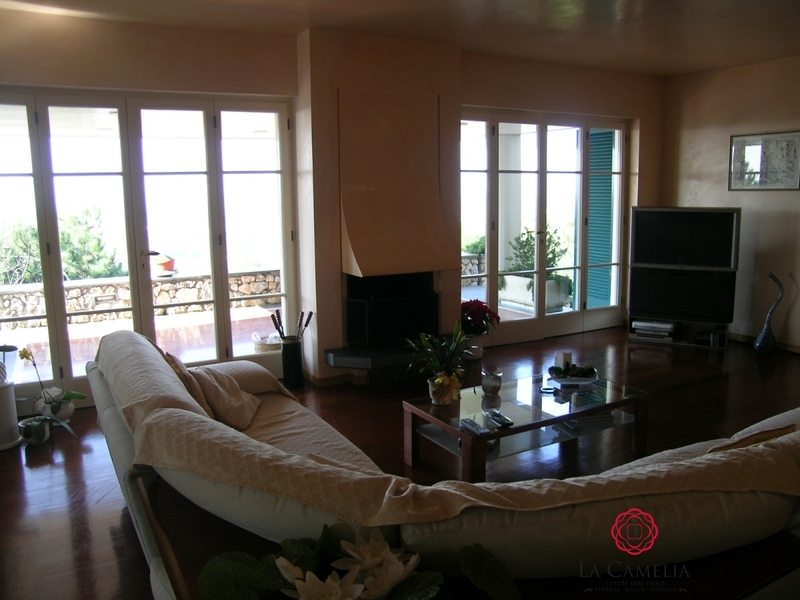 •	The 1ha of land surrounding the property is composed of a terraced olive groves above the villa and a large garden with fruit and pine trees. •	The owners have been evening out the level of the garden to create further outside space. •	Ample space for a swimming pool. •	Utilities: LPG central heating system, mains water from a cistern with pumps set on the top of the hill supplying water at high pressure, electricity and telephone on site. •	Main driving distances: Versilia coast 10 mins, Pisa airport 40 mins, Lucca 20 mins, Florence 1 hour.